Apple introduced the first iPhone in 2007. It combined three kinds of technology— a widescreen iPod with touch controls, a mobile phone, and Internet device (Ritchie). Steve Jobs said, “iPhone is a revolutionary and magical product that is literally five years ahead of any other mobile phone. We are all born with the ultimate pointing device—our fingers—and iPhone uses them to create the most revolutionary user interface since the mouse” (Ritchie). Apple thought and still does think that the iPhone makes everyone geniuses. The iPhone was promoted through television advertisements, posters, online advertisements, etc. that showed its groundbreaking functions. The iPhone breaks down many binaries— being face-to-face while having conversations, the space/distance between people, etc. The cultural response when the iPhone emerged was instantaneous and people were ecstatic that this device had arrived. Over time, the perception of the iPhone has changed. In Re-Newing Old Technologies, Tom Gunning explains the importance of the cultural archeology of technology, which refers to grasping again the newness of old technologies. 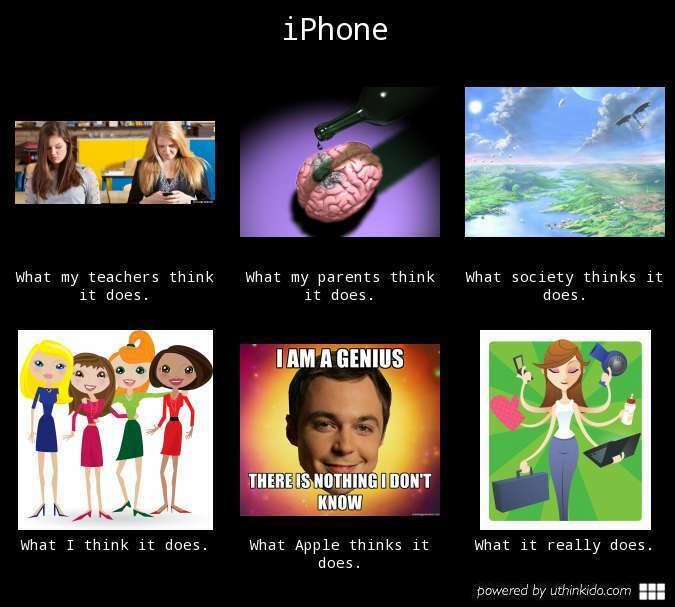 The excitement surrounding each new generation of the iPhone proves how this ideology is, in fact, true. People go through Onians’ four stages of amazement every time a new generation of the iPhone is released. For example, when I received my iPhone 4, I was amazed that it was a shiny white, slick, thin phone and I couldn’t believe how “pretty” it was (Stage 1: a striking visual or aural experience). I was in shock and didn’t know what to do with it. (Stage 2: physical paralysis). Since I was fascinated by the iPhone and everything it could do, I wanted to learn how to use it to its greatest potential (Stage 3: a mental reaction leading to learning). Finally, using my iPhone has become part of my lifestyle. Among other things, it reminds me to do tasks, wakes me up in the mornings, and, most importantly, allows me to keep in contact with my friends and family (Stage 4: a new action) (Gunning). Gunning uses the word “uncanny” to describe the unfamiliarity which greater and constant exposure [to the technology] will overcome (Gunning). The iPhone is uncanny because it takes items that we use daily and makes them virtual. For example, the iPhone is like one’s own miniature computer. It is normal for people to use computers, but it is an “alien” concept that the iPhone, being small, is like a computer in and of itself. Through de-familiarization (Gunning), people have “rediscovered” this technology. The iPhone is a revolutionary device that has changed the world (and people’s lifestyles), creating a way for people to do and be a million things. Gunning, Tom. “Re-Newing Old Technologies: Astonishment, Second Nature, and the Uncanny in Technology from the Previous Turn-of-the-Century.” In D. Thorburn and H. Jenkins (eds). Rethinking Media Change: The Aesthetics of Transition. Cambridge, MA: MIT Press, pp 39-60. Ritchie, Rene. “History of iPhone (original): Apple reinvents the phone.” iMore. 26 August 2013. Web. 31 January 2014. <http://www.imore.com/history-iphone-2007>.